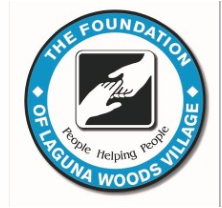 The mission of The Foundation of Laguna Woods Village is to provide temporary financial assistance to economically disadvantaged village residents. The needs of individuals are identified and verified by the Department of Social Services and held in confidence. If you have a friend or family member who may need temporary help, Laguna Woods Village has a wonderful Social Services Department -- always ready to lend a hand. Recipients remain anonymous to The Foundation and all assistance payments are made directly to the service providers. Please don't worry. Your request is kept strictly confidential. The Foundation, when requested by Social Services, provides the funding only to the provider, not to the client. To reach Social Services help is only a phone call away, 949-597-4267. In 2014 we donated over $20,500. in grocery cards.